Vincenc Morstadt was a German visual artist born in 1802. This drawing depicts Wenceslas Square, one of the main city squares and center of the business and cultural communities in the New Town of Prague, during 1830. In 2016, more than 44 million Americans hiked and/or backpacked throughout the United States, according to statistics portal Statista. Today, going for a walk in the woods is an American pastime. But, in truth, it’s one that’s still very young — it wasn’t until 1933 when the U.S. Forest Service deemed hiking a recreational sport in its annual report. 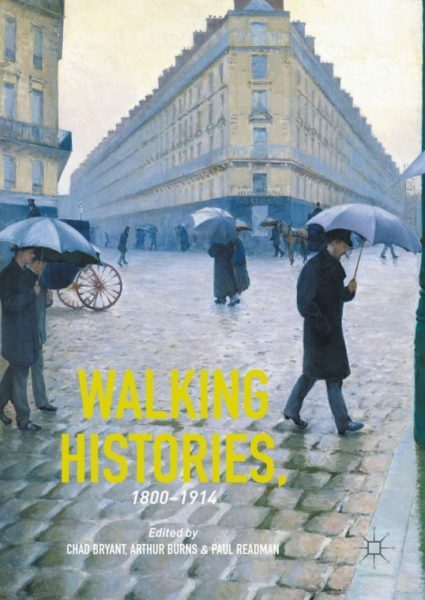 Bryant, along with King’s College professors Arthur Burns and Paul Readman, discuss this topic in a new book of essays titled, “Walking Histories: 1800-1914.” Each essay focuses on the historical significance of walking in Great Britain as well as Eastern Europe, Russia, South Asia, and Australia. Each author’s piece moves well beyond the romantic walk — “a poetic appreciation of the sublime and picturesque” — to ask how walking became embedded in the modern experience more broadly. 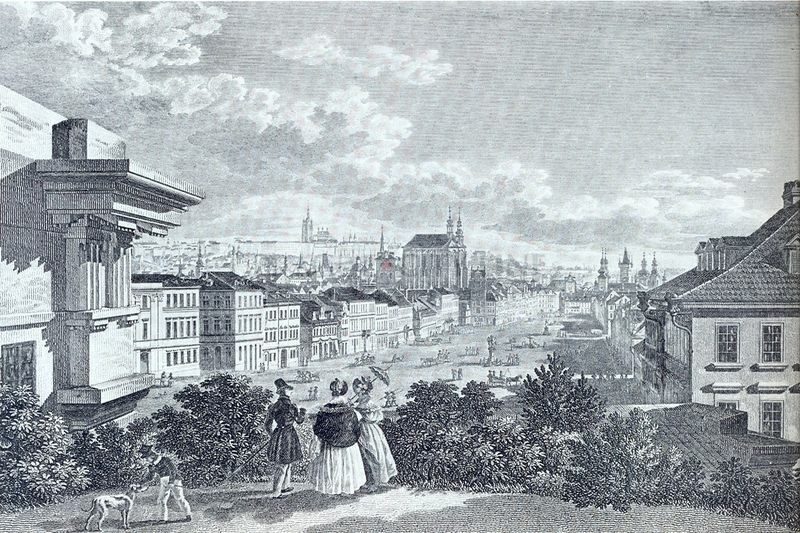 Bryant’s essay, specifically, focuses on how walking transformed the middle class in 19th-century Prague. In the early 1800s, improved road systems led to a decline in highway robbery, making travel safer. This new infrastructure included the first sidewalks and gas lamps, encouraging people to explore their cities beyond the limits of daylight. During that time, cities across Europe experienced a rising middle class — a group of people who thoroughly enjoyed the benefits of their new status. Taking heed from aristocrats, who often walked in their private gardens, members of the middle class erected public parks and began exploring the countryside. “To be middle class meant to obtain financial and social respectability through a set of practices often borrowed from the nobility,” Bryant writes. Although Prague’s middle class did exactly that, they also sought to distinguish themselves. “So they’d dress up in a nice frock and walk through the various parks on the weekends,” he says. This separated them from both the upper class — who strolled all week long — as well as the lower class, who walked mostly to commute to work. Fashion also played a role. Men donned specially designed walking hats and tobacco bags, while women flaunted new gloves and umbrellas — the latter derived from the noble practice of carrying a dueling sword. Even the children came along, accessorized by all sorts of rolling toys, dolls, and butterfly nets. During the late 18th century, the rising middle classes also began putting one foot in front of another simply to admire the beauty of the natural world. They “wandered less purposively, seeking repose and solace among moors, mountains, beaches, ruins, and villages, and other places that breathed of older, less urbanized ways of life.” Whether this developed as a product of the Romantic Era or came before it is to be debated, but soon enough writers like William Wordsworth, John Keats, and Ralph Waldo Emerson wrote prodigiously about their experiences in nature. On International Women’s Day in February 27, 1917, for example, female textile workers in St. Petersburg, Russia, marched from their factories chanting, “Bread!” in response to the scarcity of food. For the next few days, more than 500,000 men and women participated in demonstrations throughout the city, setting in motion events that would lead to the Russian Revolution. Thankfully, the evolution of walking also led to other, more positive developments like the creation of public museums. The Louvre, for example, remained a private museum of the royal family up until 1793, when it was eventually opened to the public. Golf grew in popularity as well — by 1909, more than 89 golf clubs resided in London alone. The first guidebooks for walkers were printed in the 1830s. Today, travelers can search through hundreds of titles for almost any excursion of their choice, and magazines like Backpacker and Backcountry are evidence to an entire industry that’s developed around the practice. As walking evolved, so did transportation technology. Although it would seem that public transportation, motor vehicles, and airplanes would hinder walking, it actually caused the practice to become something else entirely. In the 19th century, railways and travel agencies “urged the harassed city worker to make a swift getaway to ‘unspoilt’ nature around which to ramble.” Today, it’s much of the same. Families travel the world to places where the train system allows them to walk from place to place and easily hop from one country to the next. The concept of the road trip encourages multi-destination excursions with spurts of city-walking and exploring in-between miles of roadway. Chad Bryant is an associate professor and director of graduate studies within the Department of History in the UNC College of Arts & Sciences. UNC-Chapel Hill and King’s College London joined forces in 2005 to form the UNC-King’s Strategic Alliance, designed to bring together undergraduate and graduate students, faculty, and staff from the two institutions. Today, the alliance has expanded to become one of the most ambitious partnerships between U.S. and U.K. universities.